The Central City Improvement District is a non-profit organisation focused on ensuring Cape Town CBD is clean, safe, caring and open for business. 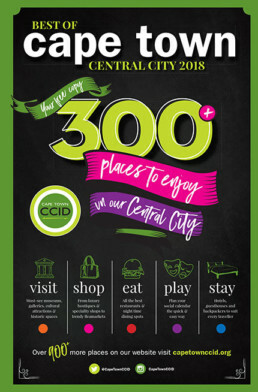 We produce the annual Best of Cape Town Central City, an informative guide to the city’s hottest places to eat, stay and play. The guide recently received an International Downtown Association Award, which recognises outstanding improvements by the work of dedicated individuals around the globe.